• Deer are most active between sunset and midnight, and during pre-dawn hours so watch for them. • Migration and mating season is October-to-January. • Slow down in posted deer-crossing areas. • If you see one deer, remember that others are probably nearby. • Use high beams at night in deer territory when there is no oncoming traffic. • If a deer is frozen in your headlights, honk your horn in a loud, sustained blast. • Don’t rely on deer whistles or roadside reflectors; they have not been proven effective. 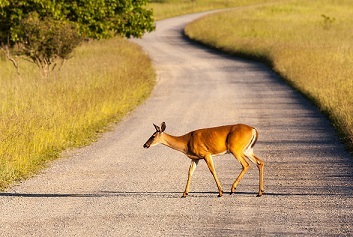 • If you can’t avoid a deer, brake and stay in your lane. Don’t endanger other vehicles. • If you strike a deer, do not touch the animal. It may harm you or further injure itself. • Call police immediately if you hit or are hit by a deer. • Take pictures of the accident scene and vehicle damage for your insurance claim. **Insurance services are avialable to Pennsylvania residents only.